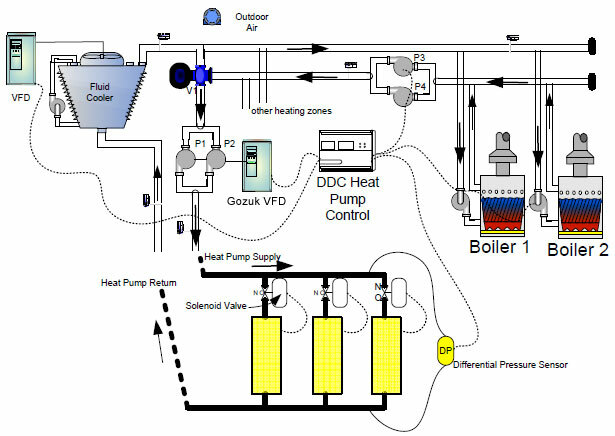 Heat pump loop systems may be converted to variable flow by installing a solenoid valve on each heat pump to stop the flow of water through the local heat pump (HP), when the unit is not operating. This allows the pump head to increase and the frequency inverter to modulate the pump speed to maintain a constant head (reduced flow). The result is a demand reduction and energy savings. 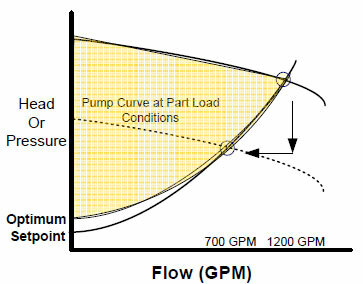 Figure 1 shows the potential energy savings (shaded) on the pump curve. A typical heat pump loop circuit, such as shown in Figure 2, controls the heat pump loop at set point, by modulating valve (V1) for heating and sequencing the fluid cooler (cooling). With solenoid valves installed at each heat pump (HP), flow can now be controlled by the frequency inverter controlling P1 & P2. The fluid coolers fan motor may also be controlled by a frequency inverter  further increasing the savings. The optional direct digital control, can integrate the complete loop by controlling the boilers, frequency inverters, fluid cooler sequencing and any additional pumps. The differential pressure sensor DP should be installed at the farthest possible location of the system. Pumps P3 & P4 are constant flow. They may also be controlled via a frequency inverter, however, a complete review of the other heating loop requirements should be conducted. In such a system, with various frequency inverters operating different pump sequences, installation costs can be reduced by installing frequency inverters with network capability. For example, frequency inverters with Metasys N2 communication bus, can be daisy chained instead of hardwired back to the controller(s).